Fun for all ages! 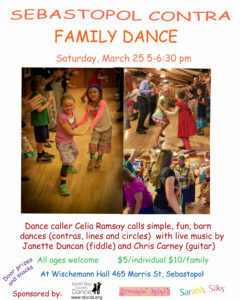 Celia Ramsay will lead us in circle, line and contra dances to the live music of Janette Duncan on fiddle and Chris Carney on guitar. We will have snacks and door prizes donated by Screamin’ Mimi’s Ice Cream Parlor and Sarah’s Silks. $5/person and $10/family. Free for NBCDS members who are staying for the contra dance after.